Recipes that prove apples and beets belong together. At first glance, it might not seem like a perfect pairing but apples and beets have a way of bringing out the best in each other. Ambrosia apples in particular go spectacularly well with dark red beets. Fermented veggies are all the rage in the health world these days and Ambrosia apples shouldn’t be left out. We talked about the benefits of apple cider vinegar on the blog in the past and this recipe from Nourished Kitchen takes apple fermentation to the next level. 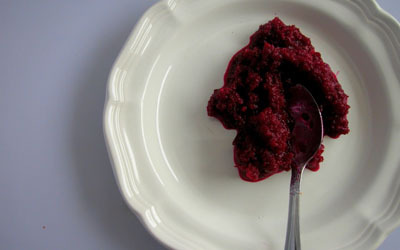 Ambrosia Beet Relish would be great as a side to a turkey dinner, or in a roasted chicken sandwich. Grab your grater for this hearty and delicious salad. Shred up beets, carrots and an Ambrosia apple. Toss them in a balsamic vinegar, oil and oregano dressing. Sprinkle with crumbled feta and chopped walnuts. This makes a great side salad or serve it with shredded kale or mixed greens and call it a healthy meal. One of our favourite snacks is Ambrosia slices and hummus because it’s a perfect combination of tastiness, protein and important vitamins, minerals and fibre. So, how can we take it to the next level with beets? Simple. Blend half a cup of boiled, skinned beets into your chickpeas, tahini (sesame seed paste), garlic and salt before blending it smooth. Your hummus will come out pink which makes it a yummy conversation starter at any potluck or dinner party. Ambrosia apples have been proving themselves as a great soup addition for the past few years (just check out these recipes from Chef Mark Filatow and Chef Stuart Klassen). Now, Ambrosia is giving classic borscht a reboot. Simply add apples and beets to a mirepoix-based stock. Bring it to a boil and allow to simmer until the flavours combine. Season with salt and pepper. You can serve it blended or leave it chunky but be sure to add just a dash of apple cider vinegar at the end to balance out the flavours.